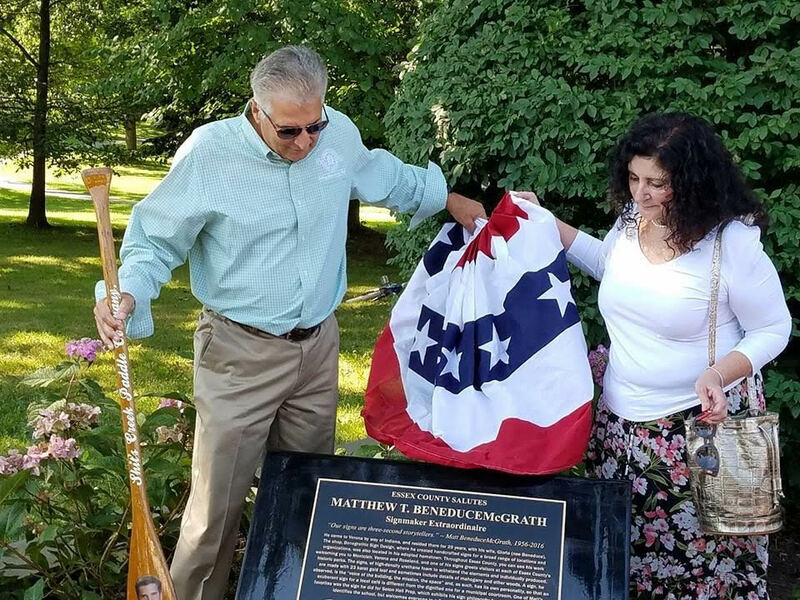 Verona, NJ – Essex County Executive Joseph N. DiVincenzo, Jr. dedicated a memorial bronze plaque in memory of the late Matthew BeneduceMcGrath on Wednesday, August 9th in Essex County Verona Park. McGrath, a resident of Verona who owned a popular sign-making shop in the township, lost his life when he was attempting to cross Bloomfield Avenue in June 2016. “Born in Indiana, Matt moved to Essex County and adopted Verona as his hometown and the base of operations for his sign-making business. His signs captured the essence of the places they promoted and were a form of public art because of the intricate design, materials and passion Matt invested in each project, including the signs for each of our County Parks,” DiVincenzo said. “Unfortunately, Matt’s life was taken from us too soon. Having a plaque in his honor will help us remember a beloved friend and artist who was part of the fabric of our community,” he added. “I want to thank everyone for their support. Matt was an artist, a perfectionist and a friend. He would have been thrilled with this great honor,” McGrath’s wife Gloria said. Elected officials and friends shared stories about McGrath. “As I listened to the many tributes, I am reminded about the famous quote: ‘Let my work speak for me.’ Matt’s work speaks for him. Just as the County Parks are historic and were restored by the County Executive, so is the work by Matt. He was a true artisan,” Assembly Speaker Emeritus Sheila Oliver said. “Signs were his craftsmanship and they were beautiful. Today we honor him for his legacy which, in addition to this plaque, can be seen in all of his signs throughout the Parks System,” Freeholder Len Luciano said. Freeholder Patricia Sebold also spoke about McGrath and how his signs have been artistic features of the parks. “I know Matt through his work. Every week, I sit under a seal that Matt carved for Town Hall. We are honored to have his plaque here at this corner by the Park. It’s the most fitting place,” Verona Mayor Kevin Ryan said. “Matt was a classic individual in the way he went about his work and his creativity. His artwork will remain a part of Essex County forever,” Essex County Parks Director Dan Salvante said. “Matt was a very dear friend who came into our office every day. He was born 100 years too late because he didn’t use any modern tools to make his signs,” Hillcrest Farms owner Pat Filoso said. “Matt was a great friend and a fantastic sign maker. He was never on time for a meeting because he had so many friends along Bloomfield Avenue and had to say hello and talk whenever he left his shop,” GSP Contracting President Greg Peterson said. McGrath was an active member of the American Sign Museum in Cincinnati, Ohio, and supported VFW Post 2342 in Fort Lee. The Essex County Park System was created in 1895 and is the first county park system established in the United States. The Park System consists of more than 6,000 acres and has 23 parks, five reservations, an environmental center, a zoo, Treetop Adventure Course, ice skating rink, roller skating rink, three public golf courses, golf driving range, two miniature golf courses, three off-leash dog facilities, a castle and the Presby Memorial Iris Gardens. Verona Park is 54.32 acres, making it the fifth largest in the Essex County Park System. The land was acquired in 1920 by the Essex County Park Commission and the Olmstead Brothers were commissioned to design the park.